During the time that I have been blogging, specially on this blog, I have learnt many things. One of them being that you don’t need fancy equipment to have an amazing blog (even though it helps). What really matters is the passion in you while blogging and interesting, variable content. It took me a while to get this into my mind. And it took me even longer to realize that for me to be happy with my blog, I had to stop comparing mine with other successful bloggers. I am in a happy moment of my life where I think that my blog is amazing, just the way that I dreamed of. I am happy with the title, design, header and specially, I am happy with the content. No, I am not contacted by PR companies to review products. I barely have 200 views per day. But it is not that that keeps me going. It is doing something I like. Something that doesn’t make me feel like I have wasted my day doing nothing. So… yea. I just wanted to point that out. Today, my loves, I came to share with you my blogging essentials. This is a topic that I love reading on other blogs because I always get something from it. Either an organization tip or a phone app that is really handy. So , I am sharing mine with you. Laptop – There is no blog without laptop and I can’t live without mine. I own an ASUS K56CB and I am quite happy with it. I don’t get along with MacBooks, my boyfriend has one and it drives me crazy sometimes. Anyways, this is my laptop and he has been my best friend for a couple of years now. Camera + Tripod + Remote Control – I have only started using a good camera when I started owning my own money. Since I started working, I knew I wanted a good camera. I love photography and a good DSLR was always something that I wanted to have. So, when I could afford one, I bought it. And it is the one I have been using here on the blog. I have a Canon 700D with 18-135mm lenses. It is the one that came with the kit and I am not thinking about getting another one. I don’t feel like I need it. Also, if I need to take some selfies or outfits, I use my tripod and a remote control that really makes the job easier. Phone – I can’t go anywhere with my phone and I can’t blog without it either. I have a Samsung Galaxy Note 3 I use it to write some blog ideas on the go but never blog posts. I don’t know why, but I just can’t do it properly. Some of my blog photography is with my phone too and I think that it does a good job. But I use it the most to interact on social media. Share my blog posts on instagram and twitter and I am getting quite active on Snapchat as well (@lcatherine91). PicMonkey – My life got so much easier when I discovered PicMonkey. Before, I have always wondered how people would come up with the perfect thumbnail and well.. it is PicMonkey. My header, blog signature and thumbnails are all done on PicMonkey. I just love it. It changes the appearance of my blog just the way I wanted to. Adobe Photoshop Lightroom – Before, I used to edit my photos with Adobe Photoshop CS 6 but it was way to complex for what I wanted. Normally, I just adjust the brightness, contrast, exposure and thing like that just to make them look a bit more natural and catchy. Adobe Photoshop CS6 was way too much for that. I recently found out Adobe Photoshop Lightroom and I have been really enjoying it. I still have a lot to learn about it but for now, it does the job. I love how it transforms my photos. External Hard Drive – Well.. this is something that I am still trying to get used to: making sure that I back up my stuff in my external hard drive. At least I know they are safe in case my laptop decides to do something stupid. And I think this is something everyone should do even if they don’t blog. Specially with school work and stuff like that! Notepad – As you may have noticed, in the last couple of weeks I have been taking this blog a bit more serious. Meaning that I am trying to upload with more frequency. Not because I want to to blogging for a living but because I love this world and I have been feeling very proud of the way how my blog has turned out. So.. to make sure I am doing everything I should and not miss any important steps or ideas that I have, I bought myself a notepad on Sainsburry’s that is the cutest thing ever. Now I have all my ideas written down and all my scheduled blog posts with To Do Lists. Music – Sometimes I have the idea for a blog post but when I have to start writing it, I struggle. It lacks inspiration and with English not being my main language, it makes it even harder. So music keeps me going and gives me freedom while writing posts. Everything goes on so much smoother and effortless. So I always have some music on, as long as I can! Bloglovin + Instagram + Twitter – social media is part of blogging and it is where I share most of my posts and get feedback from. So I try and keep in touch with all through social media. And also I have been loving Bloglovin. It makes it so much easier to read all the blogs I like and comment as much as I can. I just love it! And this is it! All my blogging essentials that keep this blog running smoothly, as much as I possibly can. 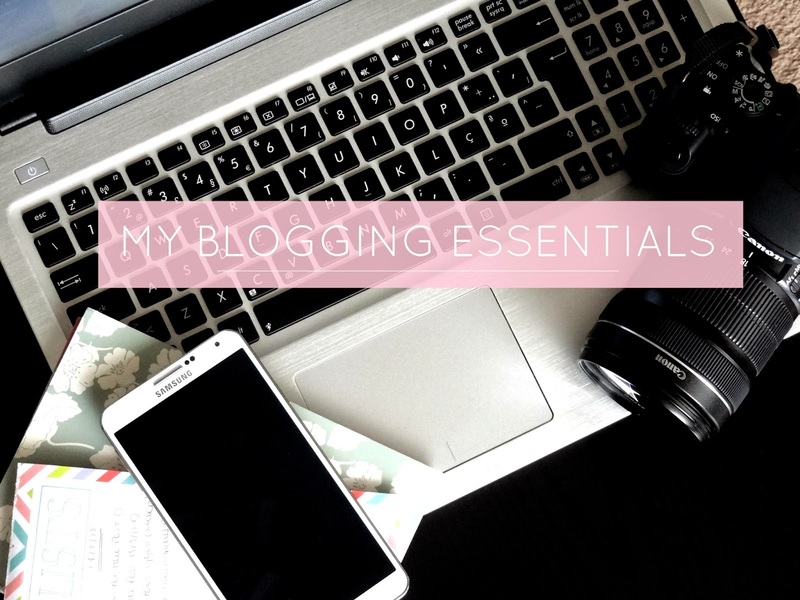 What are your blogging essentials? Any app or tip that you can add to this? Share in the comments below!